CLOCKWORK features eight independent gate sequence outputs each with up to 64 steps for complex programmed drum and rhythm sequences or for driving other clocked modules. 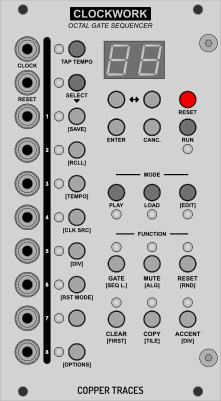 The multipurpose reset input works as a standard reset or can be used to trigger other functions including gated randomness and output rotation. Different random algorithms are included for shaping partially or completely generative gate patterns.